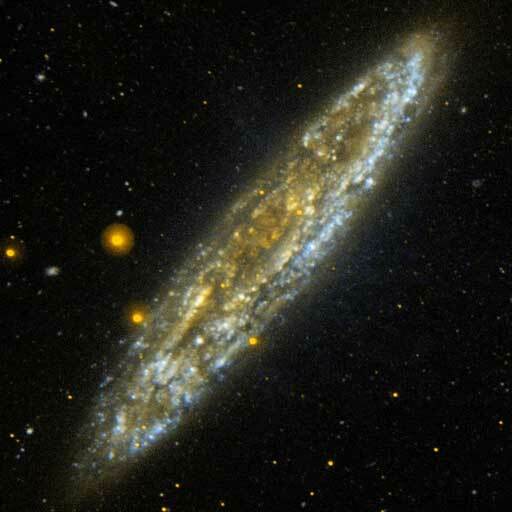 The Silver Dollar galaxy, or NGC 253, located 10 million light-years away in the southern constellation Sculptor, is one of the brightest spiral galaxies in the night sky. In this edge-on view from NASA's Galaxy Evolution Explorer, the wisps of blue represent relatively dustless areas of the galaxy that are actively forming stars. Areas of the galaxy with a soft golden glow indicate regions where the far-ultraviolet is heavily obscured by dust particles.